Does your dog fancy themselves as a bit of a stud ? Then something like the Tuxedo dog costume would be perfect for him. nnWe have dog costumes for loads of different occasions like Dog Parties and Halloween. We have perfect dog outfits for when they have been bad – like our Prisoner Pooch Costume. nnBuy one of these wonderful costumes for your own dog or buy them for gifts for friends and family. 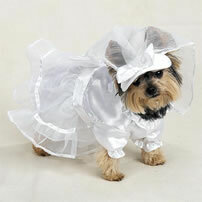 nnOur bride and groom costumes are fantastic for giving as presents to friends who have dogs that they love.